When the body does not receive enough water, it has a difficult time functioning well—beginning with the brain, the gut, and the heart. Even mild dehydration can cause a child to feel sluggish and less energetic, which may affect his or her performance when doing schoolwork or participating in athletics and lead to irritability, low energy, and strong-smelling urine. Water helps to keep the skin and lips well hydrated, prevents overheating and constipation, and helps replenish fluids lost from sweat. “If children drink just enough to take the edge off of their thirst, they could be walking around mildly dehydrated,” says Melinda Johnson, MS, RD, a lecturer at Arizona State University, the owner of Nutrition for Slackers, LLC, and a national spokesperson for the American Dietetic Association (ADA). More severe dehydration can lead to poor internal organ function and may require going to the hospital for IV fluid replenishment. “It is impossible to force children to eat and drink,” says Sarah Krieger, MPH, RD, LD/N, lead instructor for Fit4AllKids weight management program for families at All Children’s Hospital in St. Petersburg, Fla., and a national spokesperson for the ADA. “They are usually good gatekeepers of their hunger and thirst needs, but a basic guideline is to provide the water supply to keep up with their demand.” Active kids should drink at least 6 cups of water per day and more with increased activity. Children can be taught to monitor whether they are sufficiently hydrated by checking their urine color. Regular trips to the bathroom and urine that is almost clear and with little odor indicate good hydration. Since parents and caregivers provide food and drink to children, “If they offer water as the main option when kids are thirsty, then they will drink it. If soda or sugary fruit drinks are on hand, then kids will reach for them first,” Krieger says. “Learning to like plain water is similar to learning to like other healthy food products—some kids need more exposure before accepting it,” adds Johnson. If they turn up their noses at tap water, children will most likely drink filtered water. Parents should make sure that water containers are clean (containing no soapy residue) and that water is fairly fresh since water left sitting can develop a moldy taste. There are plenty of fun options for kids who choose plain water. A colorful stainless steel water bottle may entice a child to tote it to the playground or summer camp or on a bike ride. Many kids prefer the taste of ice cold water over cool water. Plain water can be jazzed up by adding orange, lime, or lemon slices; sprigs of mint; or ice cubes made of 100% fruit juice. Unsweetened teas containing fruit bits in the bag are yet another option, Krieger suggests. To maintain a healthy weight, plain water is best. It has no calories and is typically free of charge too. Ideally, a thirsty child should be given plain water first. Then he or she can enjoy a smaller volume of a caloric beverage. “Flavored water is an OK choice for kids sometimes, but it really should not be their main source of water,” Johnson says. “It is similar to plain fruit vs. sweetened fruit. Strawberries sprinkled with sugar are all right as a treat, and certainly better than a candy bar, but make sure that kids eat plain strawberries more often. Taste matters—it’s why people prefer some foods and beverages and dislike others. Sugar sells and can make any food or beverage taste better. Flavored water appeals to parents looking to offer their kids less soda. Kids will drink more because of its sweet flavor and therefore may become more hydrated. While Kool-Aid was an early form of flavored water, Gatorade debuted in the early 1990s and Vitamin Water around 2000. The latter two were promoted as healthful drink choices. The first flavored drinks were loaded with sugar—approximately 120 kcal per 8 oz. 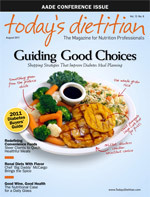 The transition to the current choices of “mixing your own strength” and “sugar-free options” has been a positive step for weight management issues, notes Marilyn Tanner-Blasiar, MHS, RD, LD, a pediatric RD with Washington University School of Medicine in St. Louis and a spokesperson for the ADA. Parents should be cautious, though. While flavored waters may seem like more healthful drinks because they are called “water,” parents should keep in mind that soda is mainly water too. How healthful a drink is depends on its ingredients. All flavored waters are sweetened with some type of sugar (eg, high fructose corn syrup, cane sugar, agave syrup) or with an artificial sweetener (eg, sucralose, aspartame). Regardless of the name, any type of sugar is about 4 kcal/g and lacks significant nutrition. Some of today’s flavored water options have zero calories; they are made with sucralose or aspartame in minimal amounts. “Artificial sweeteners are safe, but if you don’t want to consume them, the best way to flavor water without artificial sweeteners is with fruit. You will add calories but with pure fruit,” says Tanner-Blasiar. Some flavored waters contain artificial colors. Parents should avoid ones that contain added ingredients such as caffeine, vitamins, or herbal ingredients and in particular, be wary of excessive vitamin B6 because consuming too much can be dangerous. Herbs have not been extensively tested, especially in children, so the side effects are unknown. “When you throw these ingredients together, you create a combination that does not exist in nature, and you are assuming that there are no synergistic effects,” Johnson cautions. Parents should also consider sodium content. According to the American Heart Association, children under the age of 3 should consume no more than 1,500 mg of sodium per day, and children under the age of 18 should consume less than 2,300 mg of sodium per day. Therefore, parents should not give their children beverages that contain high amounts of sodium unless it is to replace lost sodium. Ideally, flavored water should be sodium free or contain less than 30 mg. The main benefit of flavored waters is fewer added calories from sugar. Someone may even lose weight by switching from a soda with 150 kcal per 12 oz to a bottle of flavored water with 5 kcal per 16 oz. Over time, fewer calories will result in weight loss. If the water is sweetened with an artificial sweetener, it will contain fewer calories than a regular soda but the same as a diet soda, Johnson notes. Drinking flavored waters may also reduce caffeine intake. If a child has been at risk of dehydration (eg, ill with vomiting and/or diarrhea or playing outside in the heat for hours and not drinking), then flavored waters may be more appealing due to the sweet taste. Flavored water that has electrolytes (eg, Gatorade) could be a good choice for a child who has lost electrolytes due to sickness or doing intensive outdoors activity. To taste acceptable, these drinks are somewhat sweetened. Plain water is also essential for a child taking a decongestant since allergy medications dry out sinuses. “Consuming sugary drinks typically make children want to drink more of them,” Tanner-Blasiar concludes.